Juncus stygius var. americanus Buch. settings, it usually occurs as scattered individuals in rather isolated colonies (Wright et al. 1992), and the colonies are few and far between. It is even rarer in the small bog pond fens. Population trends of J. stygius var. americanus are difficult to assess. Habitat conditions in the larger peatlands seem to have been relatively stable over the past 30 years, which is the period of time ecologists have studied fen habitats in Minnesota. However, actual populations of J. stygius var. americanus are not being monitored anywhere in Minnesota, so their current status compared to 30 years ago is not known. Serious, but unquantifiable, threats are posed by climate warming, water diversion, and invasion of non-native species. Juncus stygius var. americanus was listed as a special concern species in Minnesota in 1984. Juncus stygius var. americanus is a perennial, grass-like plant. The stems are round in cross-section, loosely clumped, and 2-4 dm (7.9-15.7 in.) tall. The rhizomes are short and sparingly branched. There are 1-2 leaves at the base of the stem and 1-3 leaves on the length of the stem. The leaf blades lack septae, which are raised cross-partitions, or they may have inconspicuous or incomplete septae. The leaves are round in cross-section or slightly flattened, 8-18 cm (3.1-7.1 in.) long, and 0.5-1 mm (0.02-0.04 in.) wide. The inflorescence consists of 1-3 glomerules, which are small, compact clusters of flowers; each glomerule has 1-3 flowers. The primary bracts are about equal in length to the glomerules and there are no bracts subtending the individual flowers. There are 6 tepals which are about equal in length, lanceolate to lanceolate-ovate in shape, and 4-5 mm (0.16-0.20 in.) long. The filaments are 2.5-3.5 mm (0.10-0.14 in.) long and the anthers are 0.4-0.5 mm (0.016-0.020 in.) long; the style is 1-1.2 mm (0.04-0.05 in.) long. The seed capsules are ellipsoid in shape and 5.5-9 mm (0.22-0.35 in.) long. The seeds are pale yellow and fusiform in shape. The body of the seed is 0.8-1.1 mm (0.03-0.04 in.) long with tails 1-1.4 mm (0.04-0.06 in.) long (Brooks and Clemants 2000). 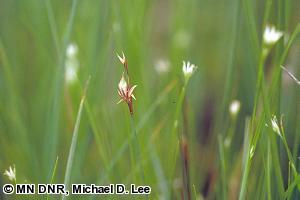 There are approximately 25 species of Juncus in Minnesota. Juncus stygius var. americanus can be distinguished from the others by the following combination of characters: flowers occurring in small clusters (glomerules) rather than singly, bracts at the base of the flower absent, leaf blades not flat or septate-nodulose, seed capsules and seeds relatively large, and seeds having long tails (Clemants 1983). In Minnesota, J. stygius var. americanus occurs only in open rich peatlands and acid peatlands. These are permanent wetlands with a substrate of deep, saturated peat. The peatlands where J. stygius var. americanus is found are generally classified as fen rather than bog, meaning they are influenced to some extent by mineralized ground water. The largest populations of the species appear to occur in the water tracks of northern rich fens and northern poor fens within the large patterned peatlands in Beltrami and Koochiching counties. Water tracks are treeless sedge fens composed of watery depressions called flarks and narrow, sinuous, subtly-raised and somewhat less wet fingers of peat called strings (Wheeler and Glaser 1979). Juncus stygius var. americanus shows a preference for the flarks in Minnesota (Wright et al. 1992). Even when it occurs in small non-patterned peatlands, it appears to be restricted to the narrow and wettest zone on the margin of a bog pond. Juncus stygius var. americanus is a slender, low-statured plant with a shallow root system. It apparently does not compete well in dense vegetation. The species is reportedly able to maintain a presence in late-successional habitats because it can exploit areas where recent water level changes create small gaps in otherwise dense vegetation. Similar conditions are sometimes created along game trails (Wright et al. 1992). The flowers of J. stygius var. americanus are wind-pollinated, and the seeds are animal-dispersed. The prominent tails on the seeds may act as elaiosomes, which are fleshy structures rich in proteins and lipids. Elaiosomes attract ants which take the seeds to their nests to feed the elaiosomes to their larvae. The seeds are left intact and discarded. In this way the seeds are dispersed short distances from the parent plant. While this process has not been reported in J. stygius var. americanus, it seems probable considering the structure of the seed. The best time to search for J. stygius var. americanus is when the inflorescence has reached maximum development, from mid-July to mid-September. However, J. stygius var. americanus is a fairly inconspicuous plant, requiring a careful eye to distinguish it from the sedges and other grass-like plants it shares its wet peatland habitat with. When addressing the conservation needs of J. stygius var. americanus, the primary consideration must be habitat integrity, particularly hydrologic integrity. This pertains to the quality, quantity, and flow patterns of water, both surface water and subsurface water. Since inflow and outflow from a peatland is critically important, it is imperative to consider hydrologic issues beyond the boundaries of the actual peatland. An impoundment or diversion several miles from a fen could have unforeseen effects that would be difficult to mitigate. Peatland vegetation is actually quite sensitive to changes such as flooding, drying, or nutrient enrichment. Since J. stygius var. americanus is one of the rarest members of peatland vegetation, it would likely be one of the first species to be affected. Several large peatland habitats of J. stygius var. americanus have been designated as Scientific and Natural Area, which receive a high degree of protection. Brooks, R. E., and S. E. Clemants. 2000. Juncus. Pages 211-255 in Flora of North America Editorial Committee, editors. Flora of North America north of Mexico. Volume 22. Oxford University Press, New York. Clemants, S. E. 1983. A key to the rushes (Juncus spp.) of Minnesota. The Michigan Botanist 24:33-37. Wheeler, G. A., and P. H. Glaser. 1979. Notable vascular plants of the Red Lake Peatland, northern Minnesota. The Michigan Botanist 18:137-142. Wright, H. E., Jr., B. A. Coffin, and N. E. Aaseng, editors. 1992. The patterned peatlands of Minnesota. University of Minnesota Press, Minneapolis, Minnesota. 544 pp.